When I first heard this was called “ABC Soup” I couldn’t figure out the name. I read somewhere online it’s because to make it, is as easy as “ABC”, which totally appeals to my cheesy side. This a very home style Chinese soup and my mum makes it with pork shoulder but I tried my best friend’s version with chicken and thought it worked just as well. You can add tomatoes and corn into the soup but I’m often happy with just carrots, onion and potatoes. I like dipping the tender meat into soy sauce with fresh chilli mixed in it. Making this in an old school ceramic Chinese soup pot isn’t necessary but for some reason it always makes it feel more authentic. Place chicken drumsticks in a large pot and cover with water. Bring to a gentle boil and reduce the heat to low. Simmer the chicken drumsticks for approximately 30-40 minutes. Skim the fat and any impurities off the top of the soup. Lightly season the soup with salt, sugar and white pepper. Add the carrots and potatoes to the pot and simmer for 10-15 minutes. Add the onion slices and continue to simmer till the carrots and potatoes soften. 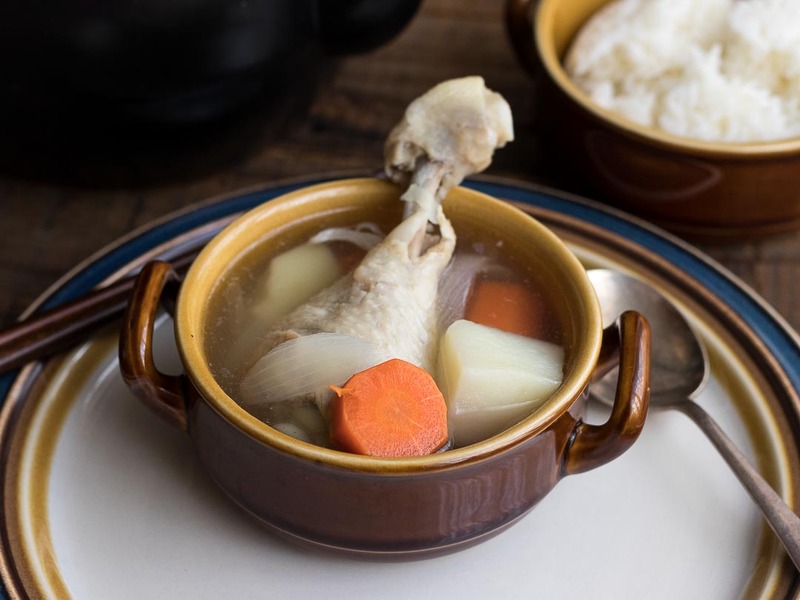 Taste the soup and season with extra salt, pepper and sugar – you don’t want it to be too sweet and the carrots will naturally add sweetness to the broth as they’re cooking. To serve, just scoop a few carrot and potato pieces into a bowl and add a chicken drumstick before ladling the hot soup over the top.